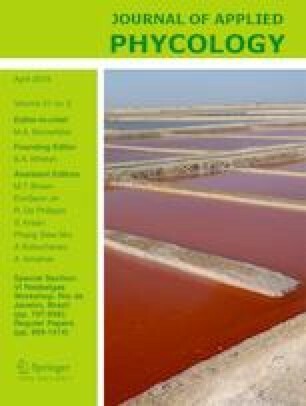 The objective of this study was to investigate the potential of a co-product, defatted microalgae meal (Haematococcus pluvialis), as a feed ingredient for yellow perch (Perca flavescens). A mixture of the ingredient combining the algae meal and soy protein isolate (at a ratio of 1:1) was added to the control diet at levels of 10, 20, or 30% to replace 25, 50, or 75% of fishmeal in a control diet. Yellow perch (initial body weight, 13.1 ± 1.6 g; 30 fish/tank; n = 3 tanks) were fed the test diets for 8 weeks in an indoor system with flow-through water at 22 °C. The results showed that replacement of 25% fishmeal with the combined mixture had no adverse effect on the growth performance, proximate composition, and serum biochemical indexes compared with the control diet (P > 0.05). However, fish fed the diets with 50 or 75% fish meal replacement were shown to have significantly reduced growth compared to fish fed the control diet or the diet with 25% fish meal replaced (P < 0.05). Increased use of the combined ingredient to replace 50% fishmeal in the current formulations may have led to nutrient imbalance such as amino acids, or minerals in the test diets. Supplementation of limited nutrients into the defatted algae meal may potentially increase the potential of the byproduct used as a feed ingredient. This needs to be investigated in future study. Results of this study indicate that the defatted microalgae meal blended with soy protein isolate can be used to (10% of the diet) replace 25% of the fish meal in the test diet without compromising the performance of yellow perch under current testing conditions. M. Jiang and H.H. Zhao contributed equally to this work. The current study was funded by University of Wisconsin-Milwaukee, Project 150-25-3150-343 PRJ93WQ). The work was also supported in part by China Agriculture Research System and USDA-ARS project no. 3655-31320-002-00D. Shaowei Zhai was partially supported by China Agriculture Research System (CARS-46). Ming Jiang and Huihong Zhao were supported by the China Scholarship Council. We acknowledge that Cyanotech Corporation, Kona, Hawaii, for donating the defatted algae meal for this study. The authors declare that they have no conflicts of interest. The views contained in this document are those of the authors and should not be interpreted as necessarily representing the official policies, either expressed or implied, of the US Government. Mention of trade name, proprietary product, or specific equipment does not constitute a guarantee or warranty by the USDA and does not imply its approval to the exclusion of other products that may be suitable. This manuscript is submitted for publication with the understanding that the United States Government is authorized to reproduce and distribute reprints for governmental purposes. The USDA is an Equal Opportunity Employer.